Now 3pm and a modest breeze was making taking multiple shots for each subject tedious. Climbing up on the slopes of Fairmont Butte, found some nice subjects but would need to wait for calm in the morning so rambled back down to my car. 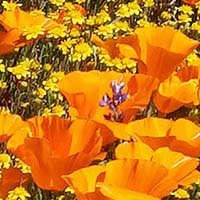 Also high clouds had begun covering parts of the sky and poppies began curling up so packed away gear. Had an interest in exploring some other flower areas of the region but first drove off for a short visit to the AVCPR Jane S. Pinheiro Interpretive Center. After volunteers at the center attended to a couple visitors, the resident State Park Interpreter Jean came in and the three of us talked about the park lands for about a half hour. All areas in my images are from private lands north of the state property boundaries which were originally included in the reserve plan and are every bit as valuable world class wildflower areas as those within the state park boundaries so need to be purchased into safety of the public domain. Unfortunately the situation has languished unchanged for a couple decades thus these lands need to be moved back into light of the public's awareness. In the period since, powerful developers have tried to put a windmill farm and vehicle race track within areas of the original 3400 acre proposal only to be turned back due to enough protests. See the bottom right corner on map link below for original proposed boundaries. The map also shows considerable yellow lines of bare soil within greens from destructive use by some dirt bike users. Once those lands are purchased, a perimeter fence with controlled entry gates would eliminate that. There are significant dedicated lands for dirt bike enthusiasts in the region such that they ought not be riding on such ecologically sensitive lands. The current hardened dirt paths could be plowed up to better open soils for seed development and within a decade of two would likely return to a natural state. 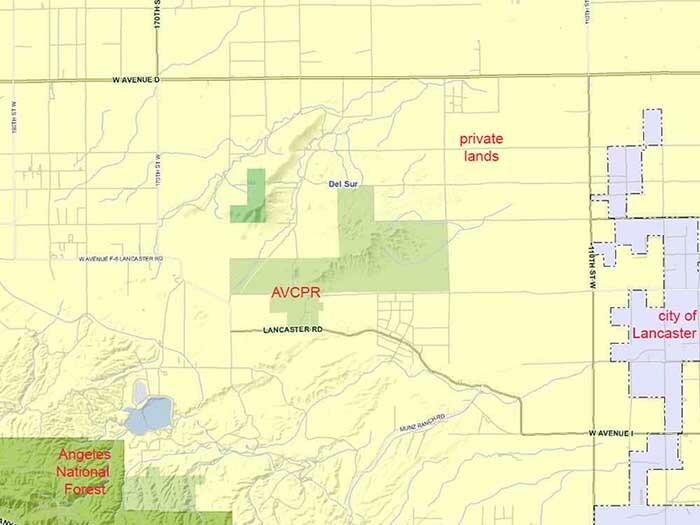 The below links to a larger detailed map I created from the Los Angeles County Assessor online map showing private land boundaries in the AVCPR area. See the inset map top left in the below link. One of the larger sections in the original reserve plan was acquired by an out of state real estate developer that jacked up the price dozens of times more than what the state had paid for all the other land together. Actually ordinary people working fund drives and corporate donations accounted for much of money raised for land purchases. 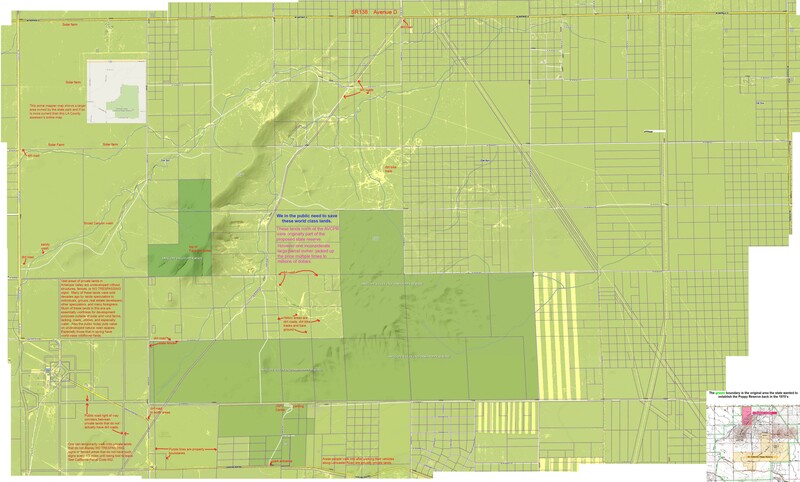 The situation is however more complicated as the Los Angeles County Assessor's map on link above shows dozens of land parcels of all sizes within the planned areas. The below links to a larger detailed map I created from the Los Angeles County Assessor online map showing private land boundaries in the AVCPR area. See the inset map top left in the below link. The below interesting story of the state flower in pre-history times is taken from the AVCPR brochure. 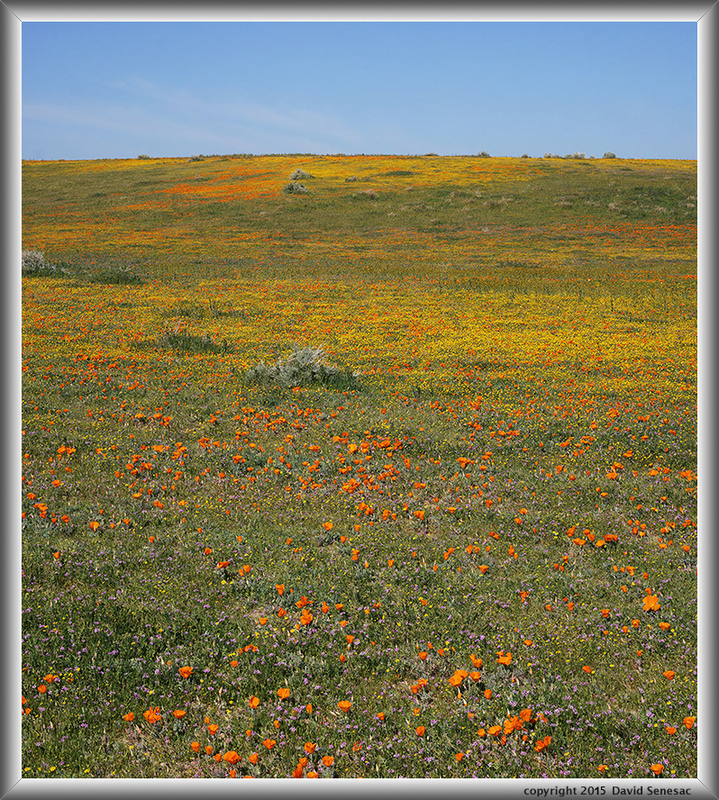 ...great fields of poppies were found throughout the state. 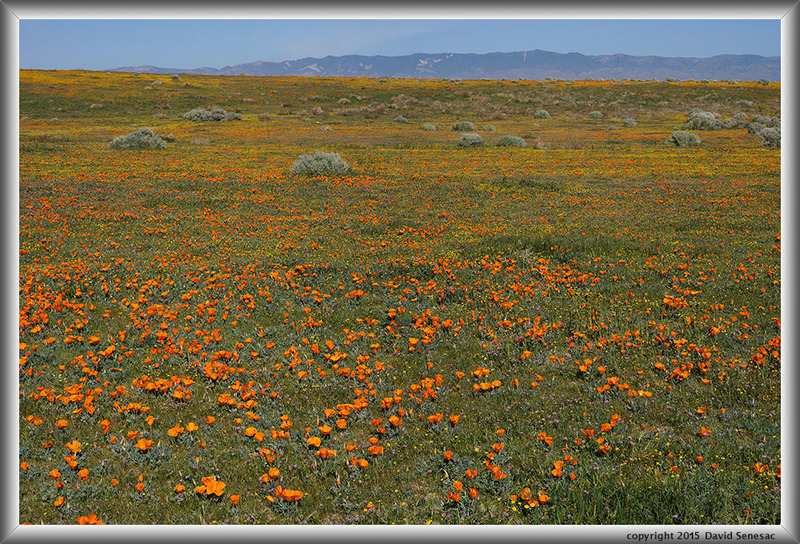 Today, while poppies grow in many areas, the only large fields left are here in the western Antelope Valley. 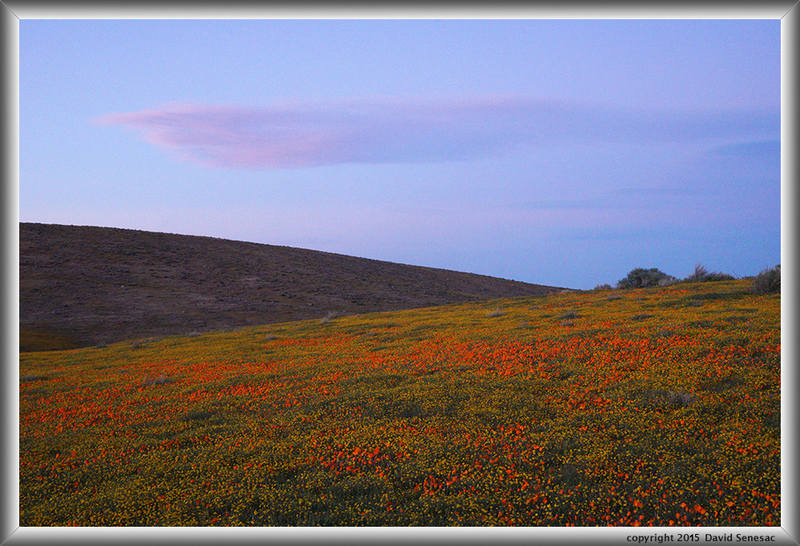 La Sabanilllade San Pasqual (The Altar-cloth of St. Pascal) is the name Spanish sailors gave the glorious fields of poppies which blanketed the California shores in the late 1700s. They were referring to the shepherd saint who tended his flock far from church and village and knelt in fields of wildflowers to commune with God. 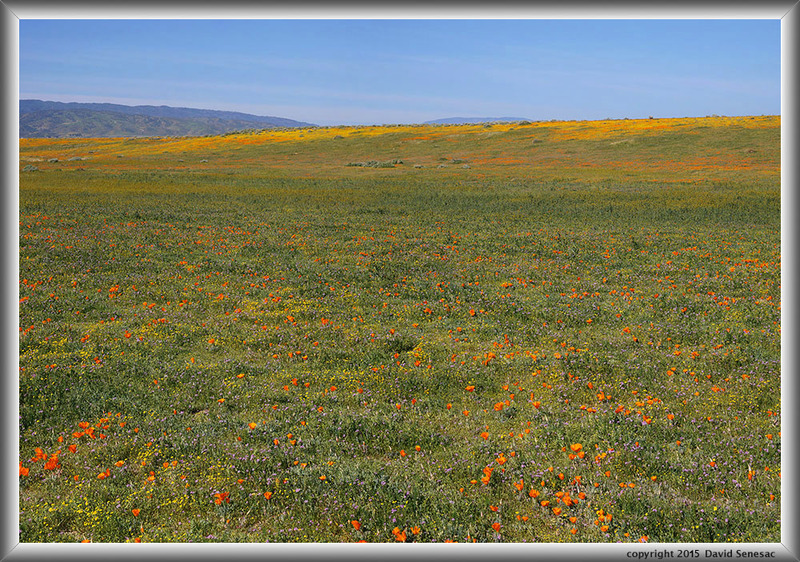 It seems to be no coincidence that the area in which the most spectacular fields of poppies grew came to be known as Rancho San Pasqual which is now known as Pasadena, Altadena, and Sierra Madre. Spanish sailors described these fields as rivers of gold which flowed some 25 miles toward the ocean. After leaving the AVCPR center, a stronger breeze was blowing, so decided to explore some areas that were visible in the distance. Thus drove out west on SR138 aka Avenue D to the rural community of Neenach, then north on 190th St W that after a minor ways becomes a wide dirt road. Driving up these roads is not advisable for those who have not studied maps as it is a maze with some dirt roads only fit for an ORV. And many roads shown on maps don't actually exist physically but are rather old public right of ways for roads that could have been built. A wise strategy is to use mapper.acme.com and switch between topo, map, and satellite tabs to see on the satellite view if a road on the map is real. Making my way northwest to the large orange poppy expanses that yearly form between Avenue A and Patterson Road and east of 220 St W, found goldfields and poppies were indeed peaking but they were even more drought stunted than those about AVCPR thus would shrivel up quickly. Significant areas of Joshua trees are just north of the poppy fields, have other species like thistle sage, and is a fine place to disperse camp in isolation at. Drove back south to SR138 then surveyed from a distance the areas about Portal Ridge above the Desert Pines Wildlife Sanctuary that showed good color. Late Sunday used a high ASA setting of 2000 to capture the image above with cirrus in pink dusk light and with a foreground of goldfields and curled up poppies. However resolution at such setting is significantly reduced due to sensor noise. During the evening, a chill breeze from the west had increased so was quick to get inside the Forester and under my down sleeping bag. There reviewed many of the camera images of what I will remember as one of my best ever days shooting wildflowers in the field. Then about 9pm turned off my headlamp for 8 long hours of sleep that was about a remote, very quiet area except for occasionally howling coyotes. Dawn Monday March 9, 2015 rose with mostly sunny blue skies. After sunrise about 7am PDT, rose slowly then worked on photo equipment and straightening out gear in the Forester. At 8:15am drove back out to Broad Canyon wash to a spectacular wide wash flat, dense with flowers I'd not made time to work Sunday. But I would have to wait about 90 minutes before poppies started to uncurl. The weekend past, expected a quiet day of shooting without others about and that was pretty much the case. The first two images with poppies not too uncurled were modest. The third subject above taken at 10:15am is a 2x2 panel from 16 total focus stack blended images using my 60mm Sigma f2.8 DN. 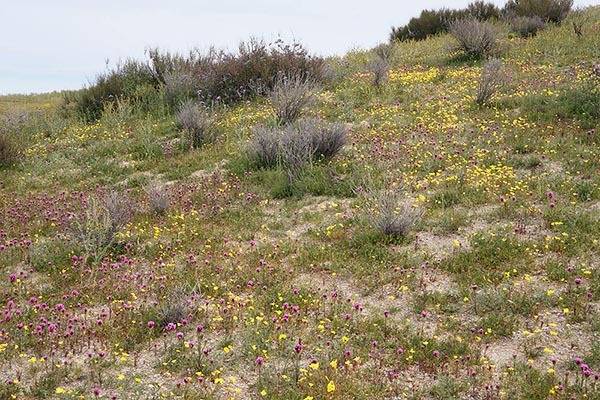 Had moved to a location where stunted redstem filaree, erodium cicutairum, were dense creating with like stunted goldfields and poppies, a distributed even height mix of yellow, orange, and pink color amid lush greens. 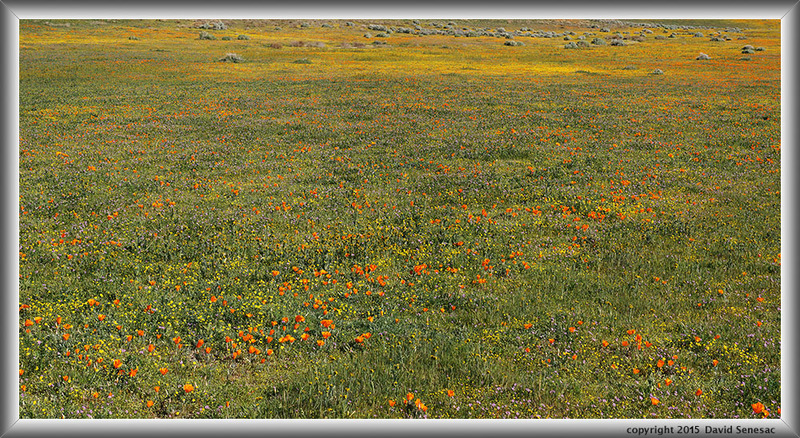 Adding to the mix were bands of yellow-orange fiddleneck. Like many of these downsized pc monitor width images with small color detail, down sampling images tends to mush out much of the high detail aesthetic that one can see with the "enlarged vertical slice view" leaving what is left boring. The depression for the sandy wash is discernible at top if one looks carefully. The top 10% with some windmills in the distance at right was cropped out as it was uncertain during the shot where to put the frame top so left extra to be dealt with in post processing. Alien European filarees are abundant in large areas of California where cattle grazing has occurred. At this early stage of their blooming, they add a nice aesthetic. However after blooms of some plants have gone to seed, their stems and leaves increasingly turn an unaesthetic reddish brown much like native fiddleneck. Also in the foreground notice how some poppies are still barely uncurled at all while most are in various stages. In another hour this same scene would show significantly more orange. Five minutes later completed another 2x2 panel above from nearby to the southwest. 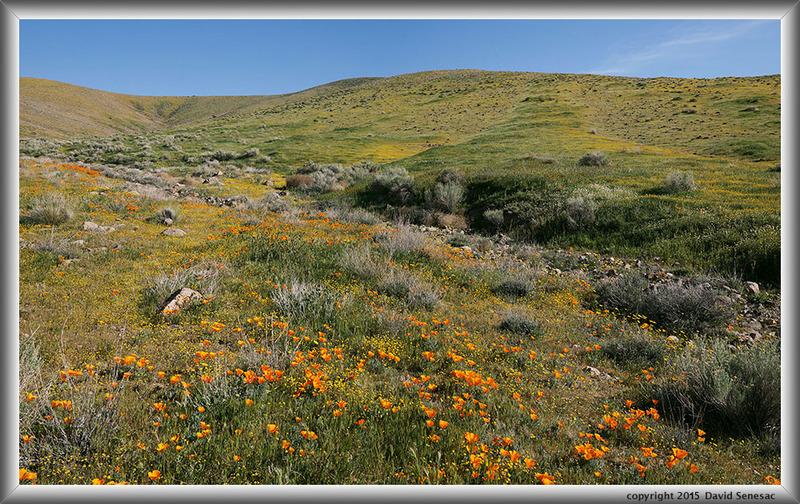 The foreground is similar to the previous image but the middle ground has a dense band of fiddleneck and the background the long length of Broad Canyon with distant mountains and sky at top. In the foreground detail are many poppy and goldfield buds that would likely open in a day or three. Although barely visible in this 9.9% downsized image, in the full image detail middle ground and up the north wash slope, one can see a few white hued desert dandelion. During my visit, many more were still in bud than were blooming and would peak about a week after my visit. In better wet years all these species can be captured near peak together because the greater soil moisture continues to be drawn into roots supporting longer blooming periods with overlapping sequences of buds opening, pollinating, wilting while other buds follow. Thus the window of peak good conditions over this very unusual spring of 2015 was the shortest during this era and a reason very few people were there to capture its colorful displays. The major newspaper in the region, The Los Angeles Times in big wet years where the bloom last week's puts out stories that send large numbers of urban visitors to the reserve. But this year it happened so quickly they didn't have time to even put so much as a squeak. This drought year the large seed bed responded given major December rains with expanses of short plants that would just put out a few blooms in a short period and then end, starved of water about roots. Each year in fields of annuals like this, some seeds that germinate are just from the previous spring while others might have lied dormant several years and even a few for decades. Annuals unlike biennials or perennials after germination just last a short period of weeks then die. Of those that germinate only a percentage will actually succeed in developing flowers that pollinate then produce seeds. Some will have flowers but not receive pollination then die. Some will send out flowers only to be totally eaten by insects before they produce seeds. Others will only have enough nutrients and water to put up a few leaves without any flowers before shriveling up. However the species has evolved to produce seeds abundantly in good wet years. Some may wonder what is the affect of wildflower enthusiasts walking on these flowers while enjoying them? Well if numbers are large that can certainly be an issue I need not go into here and is why concentrated parklands as those in the reserve require visitors to stay on pathways. If just a few people step on some of these plants at low density during the blooming period within vast areas causing some to be damaged and die unproductively it is however a trivial factor for reasons above as to what springs up in following years. Note that if one steps on the much fewer perennial plants like the rabbitbush, such is destructive because those plants live for years reproducing slowly over their range. For my fifth subject at 10:25am, moved closer to the wash wall to what appeared to be the hottest color area of the flat which is the 1x2 panel below. Set up a couple more subjects then near noon a breeze was becoming an issue so had some lunch and then took a nap. Later mid afternoon climbed up on the northern flank of Fairmont Butte taking several shots though intermittent breezes made each shot tedious. Several otherwise fine landscapes were contaminated by dried brown tumbleweed that tend to pile up in hollows and gullies. A hand touching these tumbleweed immediately becomes impaled with many of their tiny sharp seed stickers so they are quite unpleasant. Someday if the state buys up all these properties this person will volunteer during winter to go around with a small flame thrower and torch em all. My first image at 3:35pm was this southeast view below looking up a wash draining northwest facing slopes. Note the shadow off the boulder at right. The yellow hued asteraceae dominating poppies in the foreground are Bigelow's tickseed aka Bigelow's coreopsis, coreopsis bigelovii. There are several other drainage washes from the Fremont Butte ridge and these coreopsis can be found about them at mid elevations. Further up the drainage, the bushy yellow perennials are narrowleaf goldenbush, ericameria linearifolia. Then higher up on the open slopes that have little soil, goldfields and rabbitbush dominate. The image at page top taken at 4:15pm shows the same drainage wash lower down. Across the wash below a patch of fiddleneck are white areas of creamcups. Generally there were more species up on these slopes of the butte than down in Broad Canyon wash while flower densities were lower. In wet years have seen a lot more flowers on the slopes but it always seemed to be too breezy to work when rambling about in the area. The still green slopes above face a truer north. Finally at 4:30pm at right, an image of a bench below the goldfield covered Fremont Butte ridge with Davy's gilia amid greener and larger poppies than were found below in Broad Canyon wash that are in a state of curling back up. An interesting but somewhat flawed aesthetic due to the fence posts mid left, tumbleweed, and brown soil. If state bought these properties the considerable old deteriorating barbed wire fences and various dumped garbage could readily be cleaned up in these areas north of AVCPR. The brown earthy patches in foreground is soil pushed out by rodents. A few large white hued asteraceae are also visible, California aster, lessingia filaginifolia. As noted in the beginning of this feature, when visiting these areas, it is important for landscape aesthetics to do so during a period goldfields bloom which is usually about a week after a soaking rain in February. It was now time to make a decision whether to stay in Antelope Valley Tuesday morning and then leave in the afternoon or leave now. I had good reason to stay and if so would have probably worked the Portal Ridge Ecological Reserve and Desert Pines Wildlife Sanctuary. Well had I actually driven over to the area Sunday instead of viewing from a distance. However weather seemed to be changing as a front was forecast to move down from the north Wednesday and suspected that was already occurring earlier than expected. It was already breezy this afternoon again so wondered if Tuesday would just be a windy day with too many high clouds? Thus sped off west towards Gorman. Reached Gorman Post Road a bit after 6pm in shadows of sunset since there are higher mountains to the west. Was surprised to find one section along the road with some very classically Gorman-like multi-color hills. The area by the road had neither a fence or was posted so rambled up the hill quickly to assess the state of the flowers and they did look nice though obviously drought stunted. Further along Gorman Post Road was ugly dry brown with few flowers. Maybe a thunderstorm had sat over the one section of the Gorman Hills? North over Tejon Pass on I5 then with darkening dusk skies down the Grapevine with an army of slow brake stressed 18 wheelers and blinding lights of passenger cars, many going much too fast. Stopped down below at the huge Interstate Laval Road maze, ate some fast food, and filled up on more liquid supplies as I would soon be in a land without any stores. Back on the road the turn off the interstate was just down the road and soon was on lonely SR166 going west with lights of the small oil town of Maricopa some 20 miles in the distance. By about 7pm was over the Temblor Range pass and then turned north onto Soda Lake Road alongside the San Andreas Fault and into the vast emptiness of Carrizo Plain National Monument. Thankyou Bill Clinton! My body of work contains many fine images from these lands most of which are on my Gallery_B sub-page. Pavement soon ended replaced by miles of washboard dirt road so kept speeds below 20 mph in order to keep my teeth from rattling too much. Not in a mood to bother looking at my maps and rather just winged it proceeding north. Roadside in headlamps were endless knee high fiddleneck. So at least the southern areas had enough water for the bristly plants to have grown that much. On and on for miles until finally when my Forester tripometer reached about 14 miles knew from experience that where I wanted to overnight would be coming up on one of the unsigned dirt roads to the left west which leads to a hilly region west of the main plain. Somehow managed to choose the most promising among a few then drove out very slowly about a third of a mile on the small dirt road and turned off the engine just before a hill. And all along the way from the turnoff in the headlights, noticed abundant goldfields and other flowers along the narrow dirt route. The type of dirt road with two hollowed tire tracks and vegetation growing up in the raised center tickling a vehicle's transmission. Turned the interior dome light on so would not get lost wandering about outside, put on my warm North Face fleece jacket and shell, grabbed my powerful Fenix HP-11 headlamp and way more bright EagleTac MX25L3 flashlight, got outside and began roaming around. Ah the feeling of being in a truly remote area much like the feel of wilderness backpacking! And did it look interesting with expanses of goldfields and hillside daisies plus a long list of other familiar Carrizo species including the beautiful thistle sage. Right beside my car was a good sized sandy wash full of curled up desert dandelion. Although landscapes might not be too impressive since they would likely just be full of yellow flowers, was sure to have a good time working close-ups as long as winds didn't pick up. Back inside the Forester went to sleep in a pleasant hopeful mood. 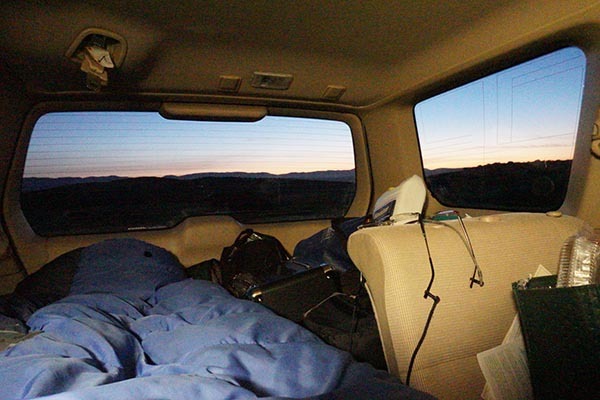 Tuesday March 10 dawn view at left from inside the Forester at my sleeping position. To my right is a shopping bag full of food. Below that was a plastic container full of all manner of paper, books, maps etc sorted into vanilla folders by region. At this time of year of few bugs, was able to leave windows several inches down from the top. Note one ought never leave a door open in such vegetated rural landscapes lest some mouse might readily jump up after smelling foodstuff and then hide under the dash. My head against the front passenger seat with all my considerable camera gear atop that seat. Yet another very quiet pleasant night of sleep on this trip. Excited about the day ahead, with pink clouds in the sky to the east, got out at dawn then climbed the little hill near my car. And yes flowers were abundant though less so and with less height than on a previous visit years before. High clouds were covering sections of the sky to the north and west so yes the weather change was indeed moving south. 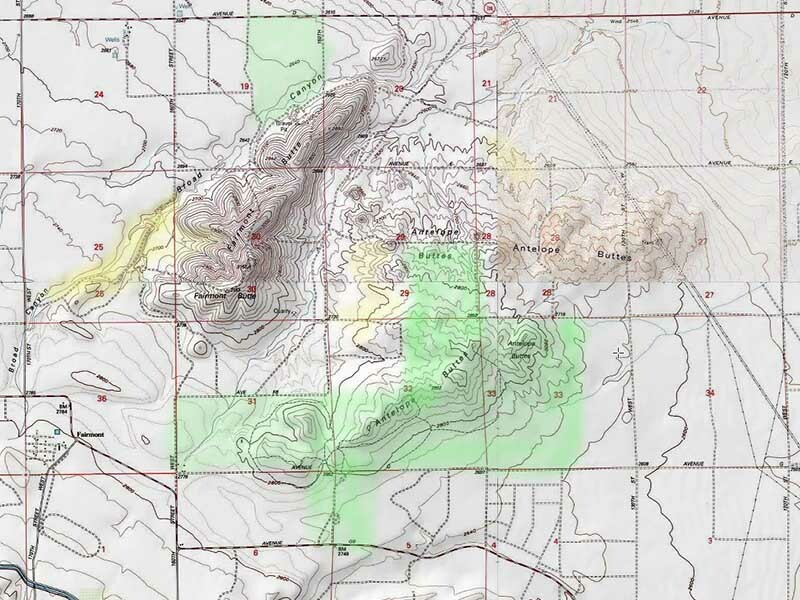 Back inside the car, looked at some paper maps then turned on a Galaxy Tab II tablet with numbers of stored USGS maps including those here in Carrizo to decipher where this was. Ate some breakfast, did the daily morning gear position switch, and attended to some equipment work. By about 7:30am was setting out into the area. Clouds now covered the sky and an intermittent slight breeze was sure to increase that had me intent on knocking off as much as possible while it was relatively calm. Tis difficult enough when one takes a single image of a close-up subject, lens stopped way down. But when focus stack blending 3 to 5 shots, the slightest breeze can make post processing impossible because of multi image registration issues. Although it may appear that close flowers move back into the same positions after a slight breeze moves plants, that is not true at the highly magnified detail scale of today's digital cameras. When multiple stacked images all in focus with slight out of registration are combined, software has no way to choose which images to use or not. A minor amount of misregistration can be fixed with programs like Zerene Stacker but such is tedious. My A6000 was now atop the ultra gymnastic Benbo Trekker tripod I use for close-up work. All the work done up to this point on the trip was with camera atop an Induro CT113 carbon fiber tripod with a Manfrotto MH054M0 magnesium ballhead and often topped with the Gigapan robotic head. 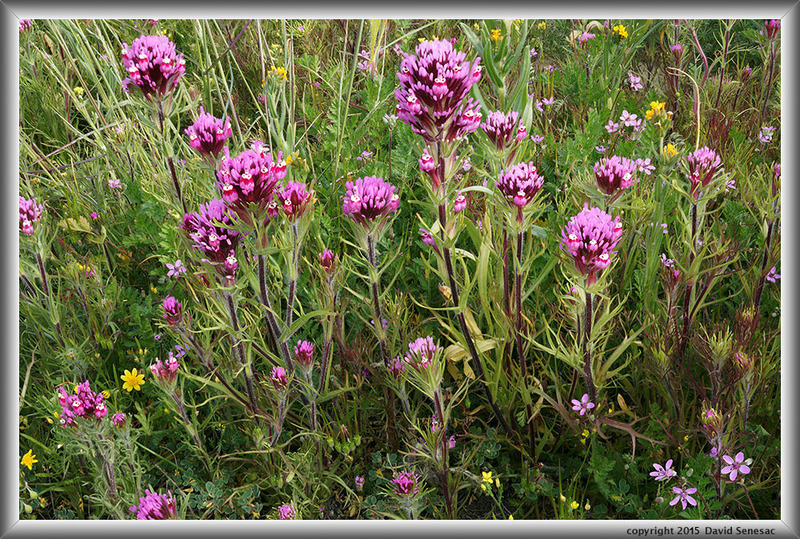 Owls clover, castilleja exserta, were common in the area so I found one nice group for a portrait below that includes a few goldfields, fiddleneck, and filaree. One of the more difficult tasks that requires patience is visually locating best wildflower subjects within dozens, hundreds, or thousands that are about a landscape. Thus look at a great many and only select a very few that not only look good but can be isolated without nearby distracting elements. At the top of my wildflower list was thistle sage, salvia carduacea, one of our state's most beautiful flowers. The strategy with these flowers often on tall stems is to put them up into a background of blue sky then use fill flash. If the sun is out, would also use a diffusion disk. And yeah, spend a lot of time laying low on the ground so this is not a job for anyone afraid of dirt or touching all manner of plants or having a few bugs or ants crawl on one. And note am not a shorts and t-shirt only person but rather almost always wear Levi blue jeans and a thin nylon shell over a t-shirt. Captured 5 images below of the flower for focus stacking about 7:45am. 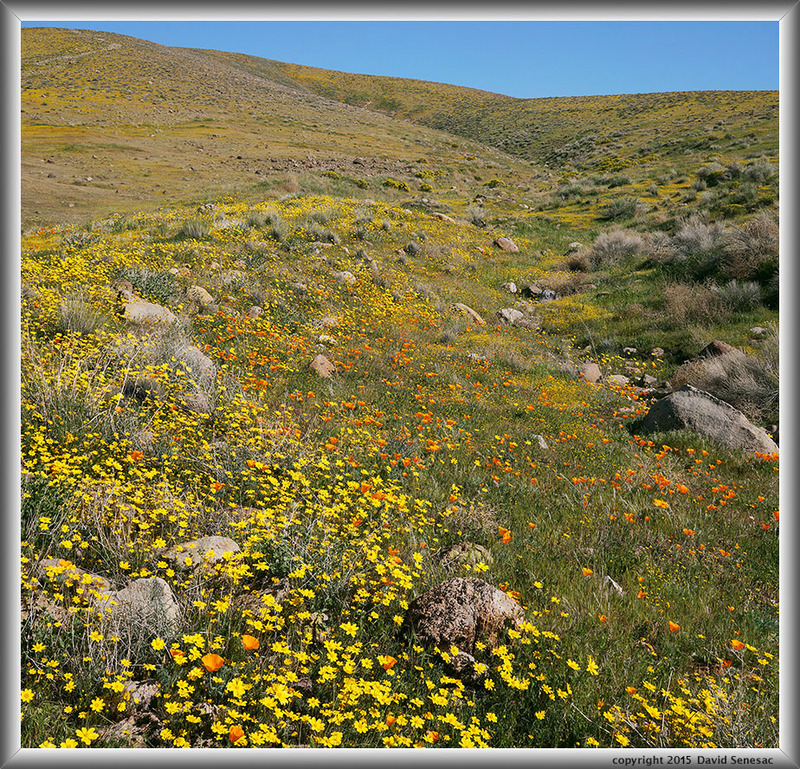 Wandering up the nearby hill I made this image below of the panorama to the west, a sea of yellow hued hillside daisies, monolopia lanceolata, with the Caliente Range to the west. Note the sliver of dirt road mid-ground and how a thin deck of clouds filled the sky. The perennial bushes are California ephedra aka California Mormon tea, ephedra californica. For much of the year these landscapes are brown, dry, and seemingly lifeless except for the ephedra. Within those bushes lives most of the life in these semi-desert landscapes. Most of the small creatures choose burrows beneath its shading canopy which also affords protection from predators. Many small creatures choose burrows beneath its shading canopy which also affords protection from predators. And yeah I heard coyotes during the night howling in song about some juicy gopher they'd chomped on that day. But it is just not animals but rather other plants that almost exclusively live beneath its sun protecting shadows and wind protection. On most specimens white fiesta flower, pholistoma membranaceum, (below right) and blue fiesta flower, pholistoma auritum var. auritum, form veritable dense jungles about its stiff branches such that hardly any light reaches the ground below. And at its sides as in image below left were often the pretty pink hued Parry's mallow, eremalche rotundifolia, with goldfields. 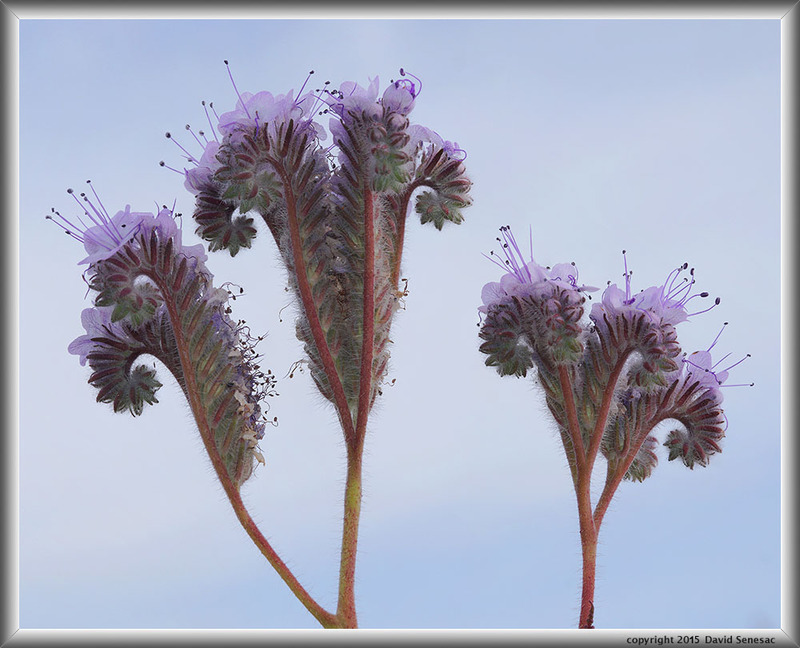 Below picture, lacy phacelia, phacelia tanacetifoli, curling cymes up in a hazy sky. 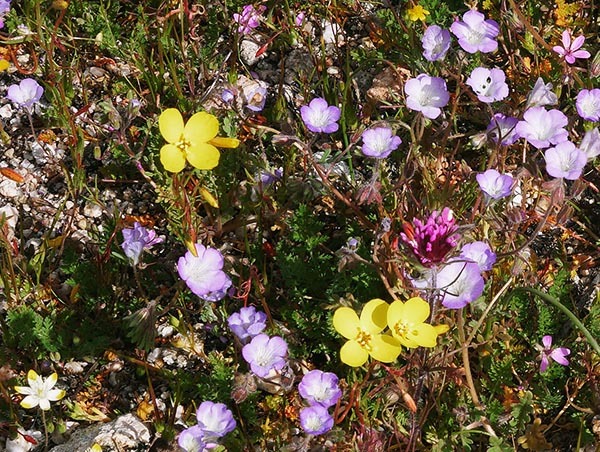 Below image, a ground close-up with filaree, owls clover, goldfields, creamcup, purple hued Douglas phacelia, phacelia douglasii, yellow hued Mojave suncup, camissonia campestris ssp. campestris. By mid morning a breeze made close-up work more difficult. There were far more species I wanted to image than would be possible so instead with simple enjoyment absorbing its wonderful nature explored the area for a future spring when there would more time and snuck in a few shots where ephedra afforded some shelter. To understand the issue one might just look at a scene like that below with a wide range of species all just now peaking and that would not last but a few more drought stressful days in the sun before wilting. It has been much better in the past and will be again in the future. Knowing locations of these type of places is key. There wasn't much hope in stretching out my trip another day as I could see the story in the skies as cloudier, windier weather approached. Late afternoon drove north to the more visited parts of the monument around Soda Lake and took some short detours checking conditions. Although plants were more drought-stunted, there were good numbers. 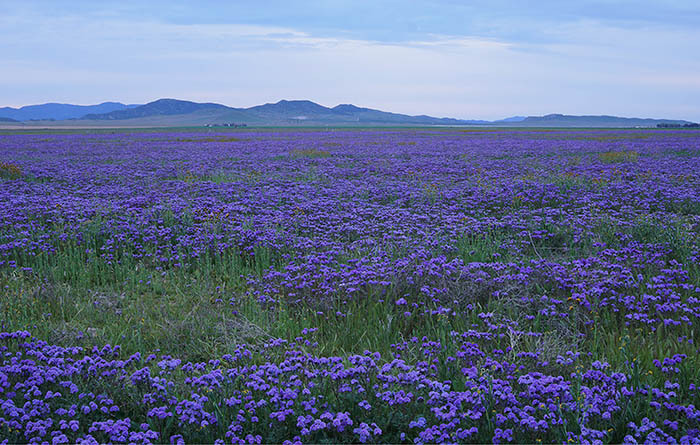 Further north out of the reserve about SR58 were some large expanses of purple hued phacelia that have been fascinating people making web reports. Of course these same fields appeared in past years. By time I reached Shell Creek, it was late dusk. Went up the road and shined my big EagleTac flashlight and could see although there were numbers of flowers like tidy tips and goldfields though the look was dry and droughty. At that point it was a long 4 freeway hours on US101 back home where I would be able to enjoy an off day midweek to just relax and post process images. That process would however take a lot of hours over the following weeks. And to write a feature like this manually hand coding the HTML and CSS takes much more effort and time.